Those were the last words said to me by Cookie on the course. It was around mile 93 at the Damnation aid station where he’d stood all day. The instruction was simple in words but tough in body. But, an immediate sense of urgency washed over me. I knew I had to run hard. In that instant I thought of Cookie and Andy, travelling all the way to Texas to support me. I thought about Louise and the boys, Paul and the Pyllon crew and I imagined there would be a hardy handful of people live tracking what was happening. I underestimated the latter by quite some way it turned out. 7.3 miles separated me from the win. Behind me Ronnie Delzer was running a tremendous race. He’d closed from 7 minutes to just 3 at Damnation. 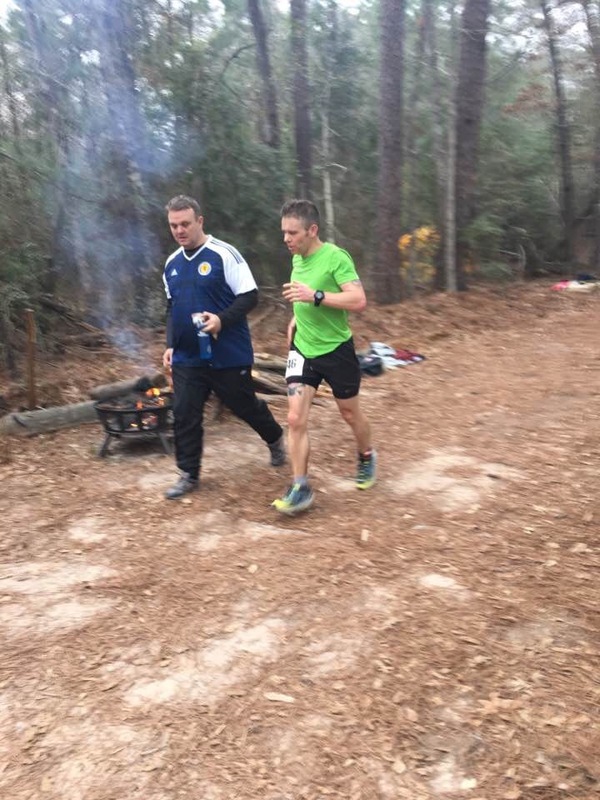 This 100 mile ultramarathon had come down to just 7 short miles. I took off. And I ran, I ran hard. Harder than ever before. I found new reserves of energy. I was flying. Until a loss of headlight almost derailed me. Before that, let’s rewind. I entered Rocky Raccoon as a bucket list race. I wanted to do a 100 miler in America and I wanted to do one which was iconic. This race ticked both these boxes and more. The list of recent winners is like a who’s who of ultra running. I entered it back in September just after Tooting Bec 24. I’d have maybe liked another month but timing aside the conditions were likely to be ideal. Shortly after booking, my dad – that’s Andy for those who don’t know – said he was coming. I was really pleased with this for a whole host of reasons. Then, Cookie got on board too. It would be a family affair. 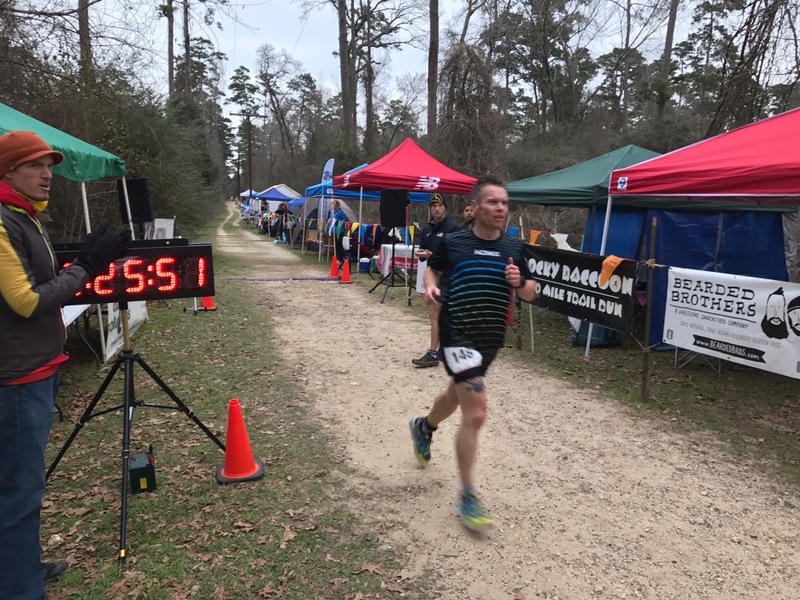 Rocky Raccoon is a 5 lap race around Huntsville State Park in Texas. It is known for being fast. And for having exposed tree roots; lots of them. As you would expect with roots ahoy, it is primarily on forest trail. It was here Ian Sharman set the fastest US trail 100 mile record back in 2011 at 12:44. However, the course this year (and last) was following a slightly different route in parts and Sharman, who won last year in 13:45, described the course as being slightly longer (1.5 miles) and with more elevation (2,000 feet). Whether this is accurate is impossible for me to be certain. The race also doubles as the USATF National Trail championships which means it usually attracts a pretty high class field, with runners looking to win a national title and the prize money that goes with it. The stand out names on the male side were Zach Bitter and Mario Mendoza, whilst the women’s had Sabrina Little and Devon Yanko – although the latter didn’t run in the end. For my part, I had a plan that would put me in the mix if I ran to it. At 6am Saturday off we popped. Zach Bitter immediately went away quickest followed by Mario Macias. I was suprised to find myself in 3rd this early. By 6 miles we were running in a trio. Me, a recovering Wotsit addict from Croy running alongside the world 12 hour and 100 mile record holder. Then, Macias and Zach stopped for a drink at Damnation and I found myself out in front. That wasn’t in the plan. Too early for this nonsense. By the time the first loop was finished I was a minute or two back of both of these fine athletes. Then, to my surprise again, by 24 miles I was back alongside them. It wasn’t as if I was pushing. Unfortunately for Zach his race was to end a few miles later. Running 10 yards ahead of me, he went over on his ankle. He said he’d walk it off but it was to be the last I saw of him. I was then in the lead from Mario M. He was to make a move from about 34 miles to take a 7 minute lead by the end lap 2. By now I was feeling ropey. The best way I’d describe it was I could have easily have taken a nap. I’d not slept anymore than 6 hours each day since coming to Texas and the travel woes from Wednesday, where we ended up on the road for 25 hours straight with no sleep, were catching up with me. All I could do was dig in. My experience of races of this distance comes in handy at these points as I have had plenty of lows in long runs. Till around mile 50 I was on fumes but managed to get out of the funk. Come 60 miles, where the race really begins in a 100 miler in my book, I was 15 mins behind Mario Macias. However, at 63 miles all of that was to change. Andy called it at the start / finish that he thought Macias was running too hard and as I passed the road crossing at 63 miles I was told I was in the lead. He had dropped. This was a surprise but helped me refocus. I had a massive opportunity here. Could I take it? By now, Mario Mendoza – two times USATF 50 mile trail champion – and Ronnie Delzer were chasing me, with Matthew Urbanski in the mix too. Funnily enough, from times I’d passed them I’d thought Ronnie looked most comfortable and so it was to be. When I got to mile 80, ready to hit the last loop, I was told I had a 9 minute lead over Mendoza at Damnation (mile 83) but as I started out on the last lap Ronnie passed, looking smooth, only around 6 mins behind me. It was game on. Within a mile of starting that last loop I started to feel sleepy again. Worse than I had earlier. It was taking every ounce of motivation, strength and belief I had to keep going. I broke each lap down into 3 parts. 1) Start to Damnation: 5.7 miles, 2) Dam Loop: 7 miles and 3) Damnation to Finish: 7.3 miles. All I wanted was a lead for the Damnation to Finish section. I dug in hard. Cookie was stationed at Damnation and gave me my headtorch as it would get dark on the Dam Loop. I was still in a stupor and was just waiting on Ronnie catching me. But he didn’t and the longer it took the stronger I felt. I remembered that he’d be suffering too. That he’d done almost 90 miles hard as well. As darkness fell – and it did so quickly – I found myself reenergised. Almost vampiric in its release. I’d trained all winter in the dark, cold mornings. I’d trained on the trails and towpaths since October for this opportunity. This was familiar territory. It was within my gift now. I resolved to hold back for a final assault to the finish from the aid station. Back to Damnation and Cookie uttered Andy’s message. I gulped some Tailwind and Coke. He told me I had a 3 minute lead earlier. This was oddly motivating. I’d had 7-8 miles of feeling quite awful yet still had a lead. I went off and I went after it. I strode out, hitting the same pace I’d been running 6 hours earlier on this section. Every step – I was confident – was taking me closer to the win. I was telling myself over and over and over again, “pain goes away”, “pain goes away”. I got to a long stretch near the highway, just before the final aid station with around 5 miles to go. I looked back and there was no sign of Ronnie and his pacer. I’d counted the headtorches I’d passed and there was only the 4 I’d ticked off visible. I knew I’d at least maintained my lead. The last 5 miles are back on the root laden trails and probably the hilliest part of the course. Some 40 mins to go. Then, with 3 miles left my headtorch flashed a warning. The batteries were dying. I dimmed it. Not ideal on this section where footing is trickiest. They flashed again. I dropped it to the lowest setting. One step up from a match. Up ahead there were a few runners. The first one I passed I asked if she had batteries. This angel, this saviour, just so happened to have 3 Energiser triple A batteries. She offered them up and after a minute or two I was shining like Celtic Park on a European night again. I thanked her, Lauren Welton, a name I will not forget in a hurry. I careered as hard as I could for the last 5k. Passing runners going both out and back. I pushed as hard as I could, conscious I’d lost perhaps 2 mins due to the light mishap. The section ends with a couple short road crossings and it was only as I crossed the last one, about 200 yards from the finish, could I relax. I’d won. Unbelievably so. Andy and Cookie were there waiting. It was over. We’d done it. Us. As a team. I’d never have won this race without them there to push me, inspire me and support me. This is our win. In the end my time was 13:39:13 with Ronnie Delzer 2nd in 13:44 and Matthew Urbanski 3rd in 14:04. Sabrina Little took the ladies race in 16:50, and 7th overall. One of the nice things about this trip was getting to meet some new folks. 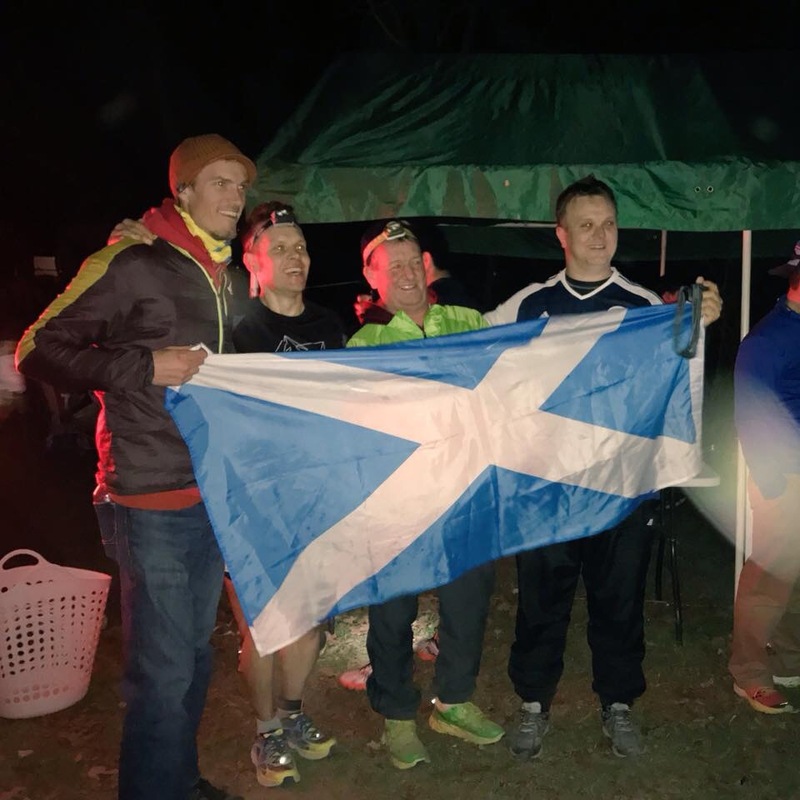 Fellow Scots Ally Speirs and Stephen Rodgers helped bring a sense of home to the race. 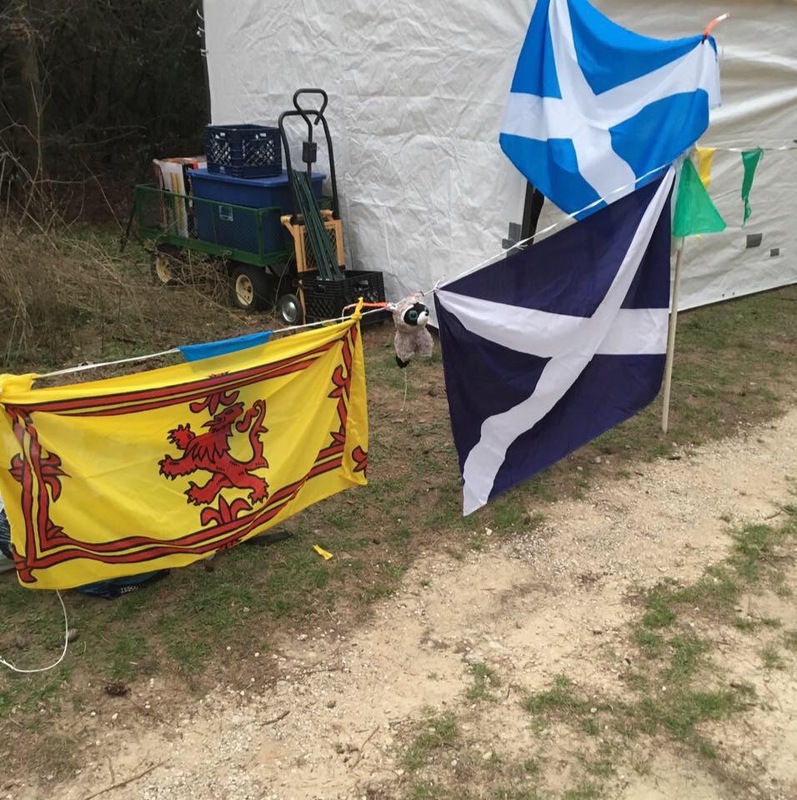 Ally and Andy created a wee bit of Scotland on the start / finish chute with a couple of Saltires and a Lion Rampant. Ally’s husband, and Rocky Raccoon podium placer from a couple of years back, Steve Speirs added some Welsh flair as well. We spent a good chunk of time with Russ Bestley who didn’t have the day he wanted but was great to meet and share a beer with. To the race team at Tejas Trails, this is a magnificent event and you should be rightly proud. Chris McWatters as RD will front a lot of the feedback – good and ill – but sheer volume of people involved is impressive and I am honoured to have a small footnote in the history of such an iconic race. And on its 25th anniversary too. You guys made me feel so welcome and I can only thank you for it. George and Skoosh, I watched that video on race morning. You know the one. It gave me the extra 0.1% you wanted. Thanks to you, Paul and everyone involved. Paul G, you made me work harder than ever before and all that shaping and developing is sensational. Wouldn’t be here without it. Pyllon Racing is gonna rock it in 2017. To everyone who sent me a message before, during or after the race. I am really sorry if I didn’t reply directly. I was inundated. But, it really does mean a lot. Thank you! Hoka, for the Challenger ATR3s. Wow! Not a blister in sight after that pounding. Then Tailwind, it kept me going when the food became too tough to eat. And, lastly, as always – Louise, Euan and Caelan. I am writing this somewhere across the Atlantic heading to Paris on the way home. Missed you all terribly. What a race and report! What an incredible achievement to win a such a big race! Congratulations doesnt seem to cover it…. Huge congratulations! What an amazing and inspiring win and we loved ready the story! Enjoyed every bit of this blog a very good read made you felt as if you were there. Very proud to know you mate and Very proud of your achievements in this sport. Absolutely out-fkn-standing! Pure grit and dedication that puts us all to shame – said it before, and no doubt I’ll say it again. Laughing (at the wotsit comment) and crying (the battery lady) at this review. So proud to see you achieve this, and fly the flag for Scotland! Well done champ! Thanks a lot, Amanda. I managed to get a hold of Lauren. Such a nice lass. I was very lucky with that! 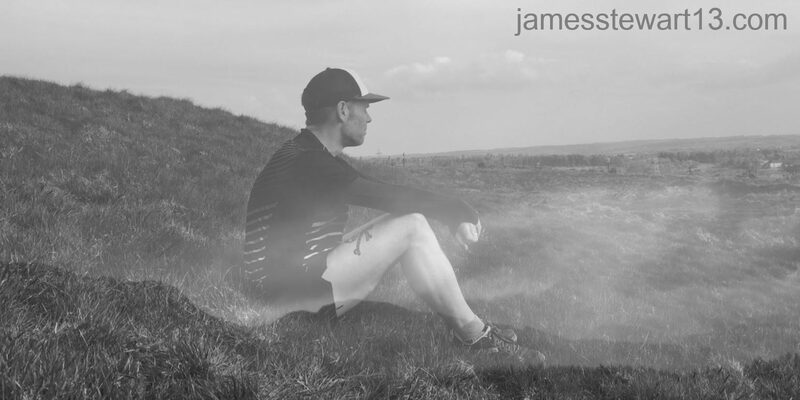 Excellent race (and report), James! I was out there too, and saw you flash by a couple of times. Well done, Sir. Thanks, Todd. And congrats to you for winning you division. Well done! Ha ha, I’ll see what I can do, Martin. Cheers! Bloody brilliant Bhoy! Get in there! Hey, thanks a lot, Robert. A great couple of days away with Cookie and Andy too. Excellent fun! I managed to get in touch with Lauren, a wee angel! Thanks a lot mate. That’s really kind of you to say. Humbled. Can’t help but think of IAK reading this; “Turn on the light/I can’t see where I’m running”. 😀 Majestic achievement & the blogs just get better & better too. Top man. Brilliant! That’s so true. Thanks a lot, Jimbo! Congratulations! And, great writing! Hey, I’m doing Loch Ness Marathon this year – my fifth – But, I’ve gotta do an ultra 🙂 Take care! thanks a lot, good luck for Loch Ness! Your modesty does you great credit James. You don’t get that from many winners, when the tracking was showing only a few minutes it added to the drama, too much maybe and we didn’t know about the torch. I imagine most would’ve freaked, I would. Those hours battling Storm Barbara paid off handsomely. Well done. Hey, thanks Mike – and for the support! What an amazing achievement and having followed your training on Instagram know that it’s totally deserved. Fabulous race report, really enjoyed it. Well done, really enjoyed your video series on race preparation, you really smashed it out the park! Next stop WS100….? Thanks, Phil! WS100 one day I’d hope! I’m a beginning runner and this reminds me that I can do it! I can eventually get to Ultra level!